Identical triplets, Cade, Ian and Milo Kinsey were born Dec. 5 in Billings, Montana. BILLINGS, MT -- A Montana mom has given birth to identical triplets and her doctor says the odds of that are one in a million. It's said that good things come in three and brothers Cade, Ian and Milo Kinsey were born Dec. 5 in Billings, Montana. Jody and Jase Kinsey hold their identical triplets, Cade, Ian and Milo, who were born Dec. 5 in Billings, Montana. Their parents, Jody and Jase Kinsey also have a six-year old son. 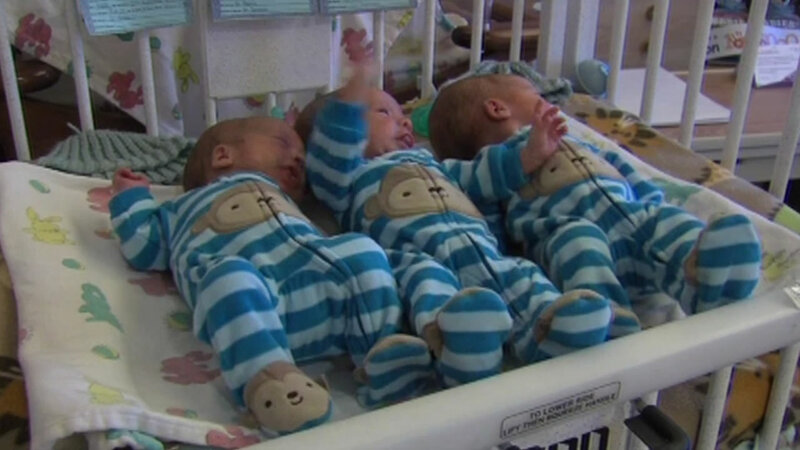 Their doctor says identical triplets are not uncommon when parents use fertility drugs, but he says the Kinseys were not receiving any fertility treatment and that spontaneous identical triplets are extremely rare.